An evelope found in a stamp album contains two encrypted messages. Can a reader solve them? Here’s another interesting crypto mystery that is discussed on Reddit. This one comes from the Dominican Republic, a country I have never been to and that has never played a role in my writings. One of the few things I know about the Dominican Republic is that Falco, Austria’s most famous rock star ever, died there in a car accident in 1998. A few days ago I came across a garage sale, which is very rare in the Dominican Republic, such things are never seen. To my surprise the garage sale was full of antiques and while I was looking at the items that were for sale, I came across some postage stamp albums with a couple of envelopes. I was fascinated and bought them without thinking much. When I got home, I flipped through a couple of pages and I did not see anything interesting. However, yesterday I decided to make a more profound observation thinking that maybe I’ll find a worthy one. Unfortunately nothing worthwhile. Then I proceeded to check the envelopes, same thing. 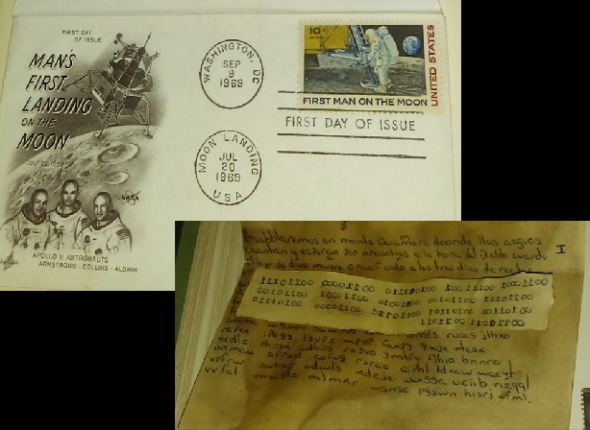 Until I came across a commemorative envelope to the first landing on the moon. I quickly proceeded to open the envelope which had a letter with nonsense words and a strip of paper with what I assume are zeros and π’s. After hours of trying to decipher the letter I gave up and told a friend of mine about it who is an active Reddit user. He recommended me to post it here to see if anyone could find an answer. 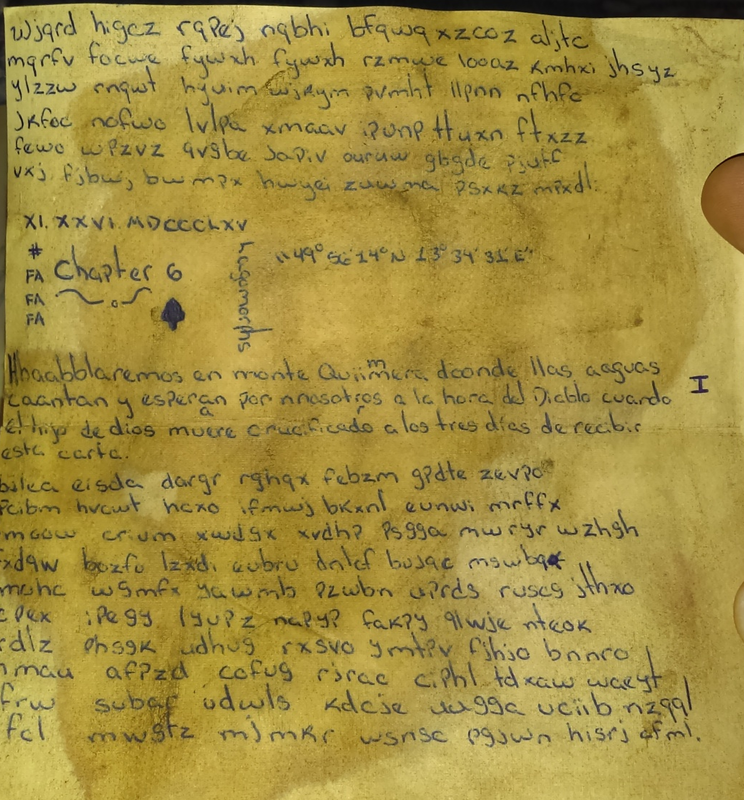 The middle passage is in the clear (Spanish), but with many strange letter doublings. In addition, the date November 26, 1865 is mentioned, along with the words “Chapter 5” (note that “chapter” is an English word) and “Lagomorphs”. Lagomorphs is a biological expression for hares, rabbits and pikas. The geocoordinates 49° 56′ 14”, 13° 34′ 31” point to a place near Prague, Czekia. The frequency distribution is much too flat for a one-to-one cipher (MASC) or a transposition cipher. So, a Vigenère cipher might be a good candidate. Note that the ciphertext contains the letter W (it is even the most frequent one), which is non-existent in the Spanish language. The letter K, which is very rare in Spanish, is the least frequent one. In my view, these are not sequences of zeros and π’s, but mirrored sequences of zeros and ones. Each group represents a byte. At least, this tells us that the message is not older than a few decades, as bytes were not used before the computer age (the Baudot code, which was developed in the 19th century, is also binary, but it is based on five-bit groups). According to reddit the Roman numerals stand for the date when “Alice in Wonderland” was first published (26 Nov. 1865). The only lagomorph in Chapter 6 is the “March Hare”. I´ve used “marchhare” as Vigenere keyword, but to no avail. I realise and acknowledge that this probably doesn’t help much. @Thomas: “Lagomorphs” is plural; how about “marchhares”? 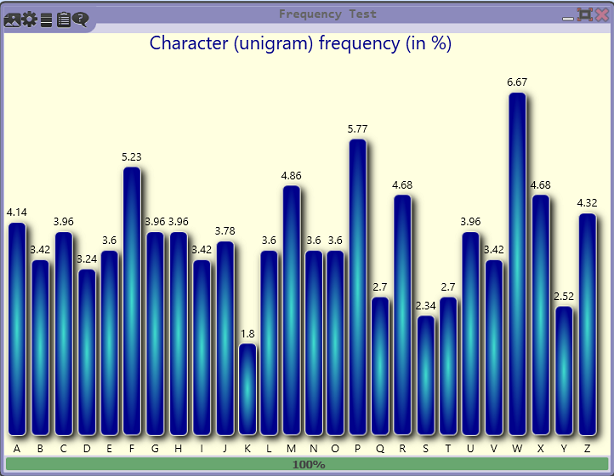 I tried our VigenereAnalyser (in CrypTool 2) using Spain language statistics… it did not find anything. The VigenereAnalyser is very powerful – the most powerful one I know. Thus, I belive it is not Vigenere… or at least not Spain, English, or German – I tested these languages. What i also tested: classic Vigenere, Vigenere-Autokey, and reading directions from left to right and right to left. These numbers can be read as coordinates: 19.7074214 N, 70.33 W. These point to a place near the north coast of the Dominican Republic, where the letter was allegedly found. It’s about 2 km offshore, near a place called Sabaneta de Yásica. Sorry, I just noticed that this was already noted in the original reddit thread. And there was a mistake, it should be 19.0774214. The last group contains only seven characters, meaning that one must be missing. Unfortunately we don’t know which one. However, this means the place is located in a certain region in the interior of the Dom. Rep., and I don’t see anything remarkable there. There is a current sub-thread – latest entry 2 hours ago – about this at reddit, https://www.reddit.com/r/MountChimera/comments/91hy9t/mysterious_letter_followup/, about communications between the buyer and the seller. Sellers (mother/son) supposedly wanted to buy back the letters; buyer refused, but agreed to share copy of letter in question with seller. Maybe worthwhile to follow that link. – Also repeated suggestions of a fake on reddit, in particular regarding the sequentiality of ink and paper stains. A quick note on the doubled letters in the Spanish text, ABIOLAAN. Since the doublings stop with “nnosotros”, i. e. half way through the three Spanish lines, I take them a) either to mean something, b) or to be an aborted attempt to further “enigmatize” the whole thing. If no one comes up with sth. sensible for those halfway discontinued doublings (which would explain why they were discontinued, i. e. those eight letters constitute a semantic unit by themselves), then the whole thing is a fake. With the superscript “m” in the first line, there are actually nine doubles, ABIMOLAAN. So what. I simply do not believe the weird story of the buyer going back, and mother and son wanting to buy back the letters. Both the “document” and the “buyer’s” story can be summed up in five letters: BOGUS! Don’t waste your time on it! A hoax – maybe – the index of coincidence tends to random text. ¡Qué diablos – debiera haber escrito BBOOGGUUSS! I agree with the commenters that this seems bogus, and for all the reasons cited. I had actually thought this, also, before the others posted (I point that out, because there is an especial value in independent, matching, conclusions). The intricate story, with all its awkward style and unnecessary detail, does not “ring true”, and seems constructed. Kind of like what a bad liar does when they are also a bad actor. But I admit that is purely intuitive on my part, and possible not defensible in any practical way. @ Richard SantaColoma: thank you for pointing out that intuition IS important in cryptology! There are so many worthwhile and real cryptological challenges that it would be a waste of time – which is the most precious gift all of us are given – to dwell on a hoax. And I have yet to see a hoax that doesn’t give itself away. For me, too, it was the story not ringing true, but, more importantly, the discontinued doubling of letters in the middle section. – On that note, let me go a little further afield, namely to the Voynich. Dealing with that elephant in the cryptological china shop is a waste of life-time. No-one else will explain it, I certainly won’t – it doesn’t interest me anymore. I actually feel sorry – in an empathetic manner – for people who still “work” on the VMS. All that time that will never come back: and which could have been spent playing with your cats, talking a walk in the woods or at the beach, talking to your spouse or a friend, just enjoying the clouds overhead. – Enough said: I am overcome by the sound of pre-autumnal locust chirping. I wasn’t sure if you were aware, when you wrote that, that I am the current chief proponent of the Voynich as a modern fake. Whether or not that it is, though, I’ve said similar things to what you wrote, many times, to many people who were spending vast chunks of their lives trying to figure out what real thing it actually is… and I try to throw them a “life line”, but usually they just get even madder at me for suggesting it. So what can one do? But I do get mad, myself, that if it is a cheap fraud as I suspect, that so many people have had so much of their lives lost over this… when, as you say, they could have been smelling the roses. Especially poor Ethel and Anne Nill, who really ruined the remainder of their post–Wilfrid lives over… nothing. Wasted. It is almost criminal, in fact. Ethel should have been writing compositions, not trying match fantasy plants to real ones for 30 years. The notebooks of characters poor Anne filled out… the work she did, the hope she held… brings tears to ones eyes. But people are still doing this, and friends of mine have died doing it, believing in it. 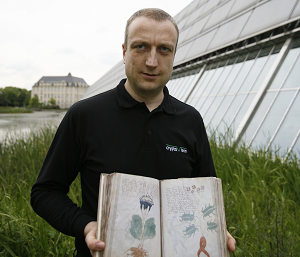 And yes it also annoys me that there are those who know the problems with the Voynich, yet will not properly advertise those problems to the uninitiated… they will hide them from the public, and are so, in a sense, in collusion with the original fraud. They are also culpable, in my opinion, by not giving a true representation of that thing… which, when given, would really cause it to be laughed off the stage. But I (passionately) digress. You pressed a button with me, obviously… and one more thing about that, though: You would be surprised at just how many people secretly agree with you, and I, but because of it, really don’t have the interest or energy to pursue it. Who are left? The True Believers, and they don’t want to hear it. My apologies to Klaus, for commandeering his comments thread… but in a sense, this is a real problem in the cipher community, just as it is in the arts, and literature, and history, communities… many of these ciphers are really the same… more Beales, more Blitzes, there are so many like them out there, I fear. And it probably amounts to many lifetimes wasted. There is the lifeline again, for anyone willing to grab hold. I see your point. But – if the VM, may it be a fake or not, makes someone delve into the Italian Renaissance, that is not the worst pastime. Provided there remains enough spare time to take a walk in the woods, smell roses or whatever. In short, a question of moderation.